A must for any scooter left outdoors, Vespa’s Genuine Outdoor Covers protect against the weather, dust and spray from passing vehicles, bird droppings, harmful UV rays, and unwanted attention, too. The police and most major insurers advise using a cover whenever the scooter is parked, because this simple precaution prevents criminals identifying whether yours is a model on their ‘shopping list’ and provides another time-consuming obstacle for thieves. Model-specific for a snug fit and maximum coverage, Vespa Genuine Outdoor Covers are 100% waterproof, to keep the weather out, and breathable, to prevent the build-up of condensation and moisture around the scooter. The material is resistant to heat, cold and harmful UV rays, so will keep on protecting for seasons to come. A draw-cord at the base secures the cover, preventing flapping and billowing in windy conditions and helping to prevent it being lifted by opportunists. They also feature reinforced cut-outs through which a chain or D-lock can be passed – a great visible deterrent for thieves and at the same time preventing the cover itself from being removed. Shaped to allow for a windscreen and top box, they feature a clear window for the number plate. A reflective strip and Vespa logo help the scooter stand out to other road-users. 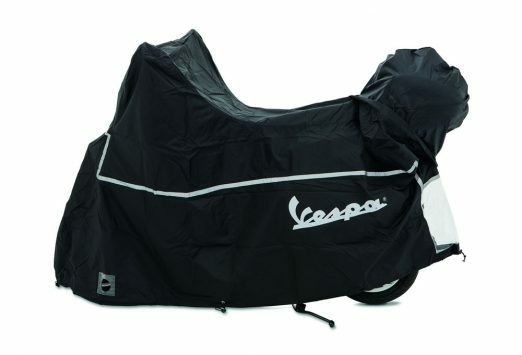 Genuine Vespa Scooter Covers are available for the GTS and GTS Super and to fit the PX, Primavera and Sprint. For prices and to view the complete range of Vespa official accessories visit www.fowlersparts.co.uk. This entry was posted in Scooters, Vespa on 19/03/2018 by Dan Sager.